This week’s update adds a new feature to the game – enemies can now retreat from battle! Also, we’ve added a new weapon, a new armor, and a bunch of new events. Existing events have been tweaked a bit for more balanced outcomes and trigger conditions, and the bugs that surfaced after last week’s larger update have been fixed. Chasing that last surviving bandit marksman on a forest map isn’t always that fun, so non-undead enemies now have the ability to retreat from the battlefield should they perceive there to be no chance of winning the encounter. Just like the player, the AI has to reach the map border in order to retreat safely, giving you the chance to intercept them if you want to let noone escape, or get all the loot. Whether an AI combatant retreats or not depends on a few factors, such as how many of his allies are still with him, how many have already fallen, and how many men the player still has. For the time being, the AI will not attempt to flee a battle from the beginning, even if they’re outnumbered. The option of retreat is meant for the last few scattered survivors. The actual thresholds for when individual combatants make use of it may still need some numbers tweaking. We know that this doesn’t solve the issue of chasing enemy archers across the map in its entirety, but it is a good step in the right direction that makes sense in the context of the game world. We’ll eventually introduce a few more tools that will enable the player to better handle such situations. 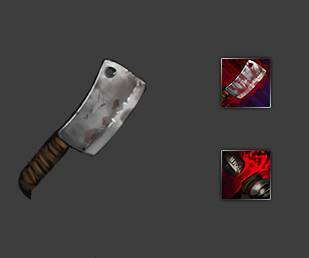 This week we introduce the Butcher’s Cleaver, a tool used for hacking through meat and bone. It is a low tier variant of the older Military Cleaver and a possible starting item for characters with the butcher background. Added ability for non-undead enemies to retreat from battle should they perceive there to be no chance of winning. Added Butcher’s Cleaver as a lower tier variant of the Military Cleaver and a possible starting item for characters with the butcher background. Changed some events for more balanced outcomes and trigger conditions. Changed out mood icons for better readable ones. Changed Pathfinder perk to now also reduce the fatigue cost for movement to half. Changed Necromancer to walk at a slightly less brisk pace across the battlefield. Changed resource limits to depend on difficulty setting. They’re now a bit higher on normal and easy. Fixed quickload/quicksave unintentionally being disabled. Fixed bug that had militia spawned with the Woodcutter’s Axe show as unarmed and unable to take their turn in combat. Fixed issue with savegames not loading correctly when the player has a Masterwork Bow. The savegames in question should now load correctly again. Fixed time not pausing correctly when switching tasks. Getting stuck with insufficient parts, due to empty vendor inventories, is just plain un-fun, especially with a cap on how many parts you can carry. There isn’t any way to plan around the unavailability of parts. If you’re going to fight, you need to repair gear, and this is at its heart a game about fighting. Proposed solution: let the player recycle gear into parts. I still think the inventory limit on parts is unnecessary too. You can currently buy extra quality weapons/armors, use them to replace the damaged ones when you’re out of parts, and mark the damaged ones for repairs when you get some parts. I don’t think this should be necessary, but it is technically a way around the parts limitation. Recycling gear into parts would probably swing too far in the other direction and make it impossible to run out of parts. It would also be a source of unnecessary inventory management. It would be better to just make parts more common as loot. Aren’t “resource limits” referring to the amount of resources you can keep with you (food, tools, arrows, medicine)? Very nice to see that team of 3 people working on a game better than a “lot of talking – not working” AAA company. Please accept my respect and keep up the spirit – you deserve a lot of real fans, continue to please them. Diesem Lob kann ich mich nur anschließen!